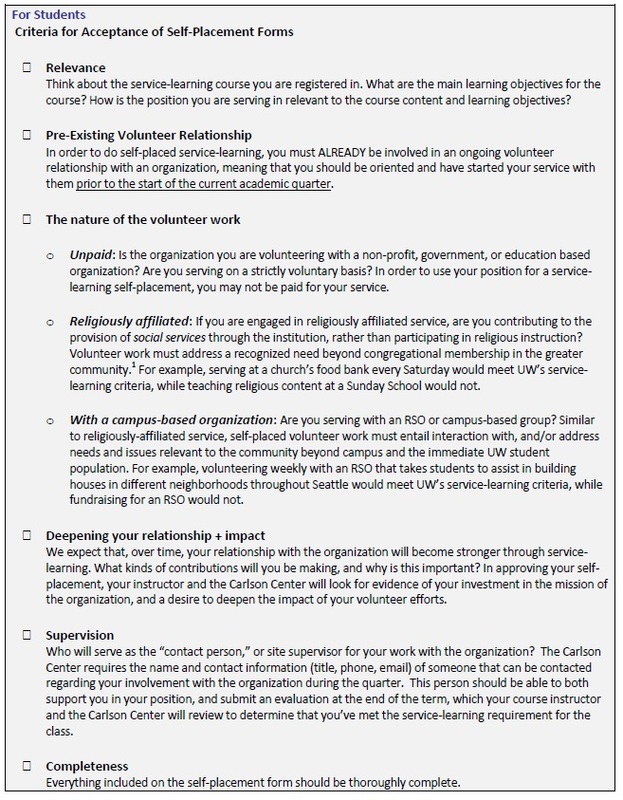 Self-placements can be used to meet the service-learning requirement for your course only if you have a PRE-EXISTING volunteer relationship with a non-profit or government organization, AND the nature of your service work aligns with the learning goals of your course. Students who plan to complete a service-learning self-placement must complete a Self-Placement Form. Forms need to be submitted AND approved by the end of the third week of the quarter. Review all the information below. To obtain the self-placement form, complete this self-advising tool. Self-placements are contingent upon your already being involved in volunteer work with an organization prior to the start of the current quarter. Discuss with your site supervisor as early as possible your desire to connect your existing volunteer work with the academic learning you will be doing in the months ahead. Make sure they are comfortable with and clear about how this will become a service-learning role, and let them know that they should expect to hear from UW’s Carlson Center at different points during the quarter (more specifically, a mid-way quarter check-in, and a request that they complete an evaluation of your efforts at the end of the term). Have a conversation with your course instructor about the position you want to use for a self-placement, briefly sharing the nature of the organization, your volunteer activities and how they relate to the class. Conversations may take place after class, during office hours or via email. Once your instructor has given you the go-ahead, you must complete a self-placement form in order to formalize the arrangement (instead going through the standard browse and register process coordinated by UW’s Carlson Center). Make sure to review, and follow, the criteria outlined above. When you complete your self-placement form, your instructor will be notified via email and they will have the opportunity to accept or decline with feedback. If they accept your form, it will move on to be double-approved by the Carlson Center, based on the criteria above. Once that successfully happens, you will receive an email indicating that your position has been confirmed. You should receive this confirmation by the end of the third week of the quarter. If your instructor does not approve your form, you will receive comments indicating the reasoning and/or next steps. If you do not hear back in the time-frame mentioned, check in with your instructor about the status of your form first, and then follow up with the Carlson Center if more information is needed. 6. Proceed with your service-learning! Once you receive a confirmation email – meaning that the Carlson Center has successfully captured your volunteer work within your service-learning record for the course – you will be set. Remember to talk with your supervisor at the organization about how you are now engaging in service-learning, and that they should expect to hear from UW’s Carlson Center at different points during the quarter.